WEATHER-PROOF CONNECTOR SETS. Buy quality Auto and Marine Electric Parts and Accessories online, Sydney. 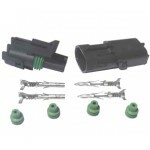 WC1 WEATHER PROOF CONNECTOR 1 way connector 20 amp rating Supplied as a kit Housings, terminals..
WC2 WEATHER PROOF CONNECTOR2 way connector 20 amp rating Supplied as a kit Housings, terminals a..
WC4 WEATHER PROOF CONNECTOR4 way connector flat housings 20 amp rating Supplied as a kit Housing..
WC4/S WEATHER PROOF CONNECTOR4 way connector square housings (2x2) 20 amp rating Supplied as a ki..
WC6 WEATHER PROOF CONNECTOR6 way connector 20 amp rating Supplied as a kit Housings, terminals a..